TE Connectivity is a $13 BN global technology leader in highly engineered connectivity and sensor solutions that create a safer, sustainable, productive and connected world. 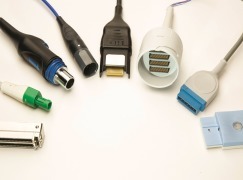 TE’s diverse range of connectivity solutions are essential elements in cars, planes, power grids, appliances, electronics, factories, medical devices, and more. Our solutions, innovation and engineering expertise connect the device, physician and patient, making surgery safer, more accurate and precise while allowing the physician to stay focused on the procedure and not the device. We are partners to more than 1,500 medical device companies across the globe – from the world’s largest medical device companies to innovative emerging medical technology companies. Every day, thousands of TE engineers partner with our customers to help solve their toughest design challenges – from inside the human body to outer space. We have global operational reach with design and manufacturing facilities in the US, Latin America Europe and Asia. Our global presence ensures that we are on hand to address our customers’ requirements at their point of need. TE is a company of engineers for engineers. Engineering innovation and creativity is at the heart of all our solutions. Comparatively, many peer companies simply “build to print” – this is not our business model. We bring expertise and insight to our solutions. This is where we add value. 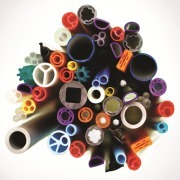 TE focuses on solutions for medical devices used in the OR, Imaging, Radiology and Endoscopy fields. We are a manufacturing partner, providing innovative solutions in 6 distinct areas: Electrosurgery, Laparoscopy, Endoscopy, Ultrasound Imaging, Electrophysiology and Surgical Robotics. TE works with our customers to make traditional surgical instruments smarter, more accurate and precise. TE’s surgical and imaging solutions enable power, data and signal to transmit feedback along a range of devices. 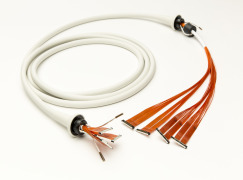 We are vertically integrated and have decades of experience manufacturing cable and interconnect solutions from design, component manufacturing to device assembly. 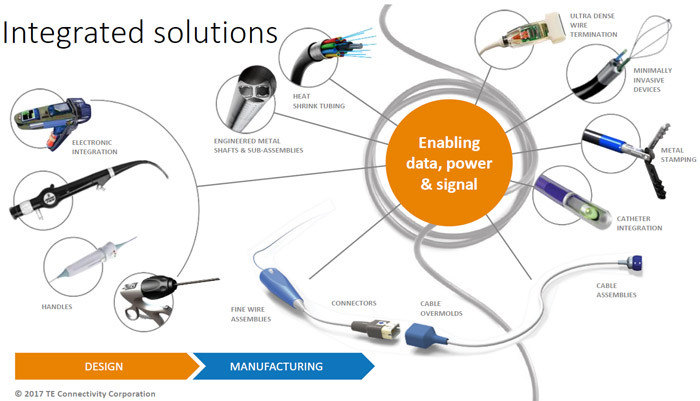 Whether you require high data rates, hundreds of signal lines in a small, ergonomic package, an optimized single-use solution or a durable, reusable power/video cable; we work with our customers to co-create devices that deliver. Specializing in Minimally Invasive delivery & access devices, TE, together with Creganna Medical, provides the full spectrum of services to design, develop and deliver finished medical devices to market. We offer a comprehensive range of outsourced solutions to medical device companies – from clinical and regulatory support to innovative design and reliable manufacturing services. 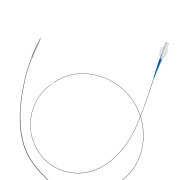 We are the catheter design & manufacturing partner of choice for the world’s leading medical device companies and are acknowledged by the industry as the top-ranking solution provider in a range of MI catheter market segments including PTCA, PTA, EP, Specialty & Niche catheters – Atherectomy, CTO, Vulnerable Plaque, Thrombectomy & GI catheters. With our newly expanded global Design Centers of Excellence and capabilities focusing on specific clinical and technical applications; these competency centers constitute teams of design experts that are the most knowledgeable in their field and collaborate for your specific technical focus. We have presence in all key medical device hubs with 350+ design engineers globally and are the premier design and manufacturing partner for your next-generation medical device. TE Connectivity (TE) is one of the largest sensor companies in the world, with innovative sensor solutions that help customers transform concepts into smart, connected creations. Electronic systems in medical equipment, devices and probes rely on sensor signals as a basis for control activities, accurate diagnosis and treatment. 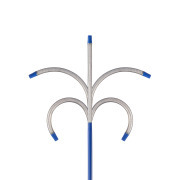 TE designs and manufactures sensors to exacting specifications for the rigors of medical applications, with ISO 13485 certification and FDA registration for various products. Our engineers provide full support of application-specific, standard and custom requirements, from product concept through manufacturing. Visit www.te.com/medical to learn more and connect with us.